Rod Taylor plays Charles, a studious young medical student, in this all-star film that drew a lot of attention from Oscar. The film is based on a pair of one-act plays by Terence Rattigan and examines the lives of a group of lonely people at a seaside hotel in England. Taylor's character is one of the more well-adjusted guests. The director, Delbert Mann, had won an Academy Award for "Marty" and considered "Separate Tables" to be one of the most important pictures of his career. As the film opens, Charles is trying to study in the lobby while the other characters swirl around him. 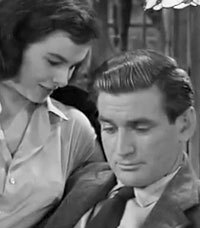 That includes his girlfriend, Jean (Audrey Dalton), who tries to persuade him to combine romance and anatomy -- but declines his suggestion of marriage. The couple retreat to bed, then reappear at the end of the film -- after the lives of the rest of the "self-reliant" guests have unraveled. "Separate Tables" seems to be one of the films that embodies Taylor's goals at the early part of his Hollywood career. "I'd much rather turn down a starring role in a bad picture and do a small role in a very good picture," he has said. Rod liked working with director Delbert Mann. "He was almost like a very kindly professor... I thought he was brilliant in a movie like 'Separate Tables' because there were so many different stories... The way Del threaded these stories together was some brilliant directing." Likewise, Mann said, "Rod Taylor was very good to work with. I worked with him several times after this," notably in an episode of "Playhouse 90" and the movie "Gathering of Eagles." Audrey Dalton recalled, "We rehearsed for three weeks and shot it in sequence, which was very unusual." In the director's commentary track on the DVD release, Mann said that he liked to work that way -- preparing just like a stage play. It gives the actors a chance to interact, learn their lines, and work on nuances. It also gives the director and crew time to adjust lighting, staging and camera placement. All of this, Mann believed, made for smoother filming and better performances. The work was certainly rewarded Oscar time. "Separate Tables" was nominated for the Academy Award for best picture, and Deborah Kerr was nominated for best actress for her portrayal of Sybil, a mousy spinster dominated by her busy-body mother. David Niven won the best actor Academy Award for his role as Major Pollock, a very proper Englishman who turns out to be something of a fraud. Wendy Hiller won the best supporting actress Oscar for her portrayal of the inn's owner, who had been wooed by John Malcolm, an American writer portrayed by Burt Lancaster. That romance is dashed, however, when Malcolm's ex-wife, played by Rita Hayworth, re-enters his life. There could have been a bit more of Rod in the movie if director Delbert Mann's initial edit of the movie had been kept. In his autobiography, "Looking Back... At Live Television & Other Matters," Mann writes that he was unhappy with the way the picture was re-edited and rescored after he and producer Harold Hecht had finished the film to their satisfaction. Burt Lancaster and James Hill felt it was too slow and long, Mann wrote, which "translated, meant that Burt didn't appear soon enough and there was too much emphasis on the Major-Sybil story." 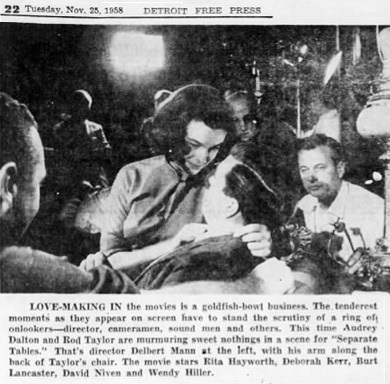 Among other changes, Mann wrote that "Deborah and David's opening scene was slashed, as was almost all of David's first scene with Rod Taylor in which the Major was set up as a talkative bore."